Image caption Activists have called Japan's programme "an illegal whale hunt"
Japanese hunters caught and killed 122 pregnant minke whales as part of its Antarctic summer "field survey". A report sent to the International Whaling Commission (IWC) reveals hunters caught 333 minkes in total. The team left Japan in November 2017 for the Southern Ocean and returned in March 2018. Japan says its whaling programme is for scientific purposes, despite a 2014 UN ruling against its "lethal research" and widespread condemnation. In a new research plan published after the UN ruling, Japan said it was "scientifically imperative" to understand Antarctica's ecosystem through collecting and analysing animals. Is Japan losing the taste for whale meat? How many whales did Japan catch? The country's New Scientific Whale Research Program in the Antarctic Ocean (NEWREP-A) sent a report to the IWC detailing the 333 minkes caught, 152 male and 181 female, during its "third biological field survey" in the area. 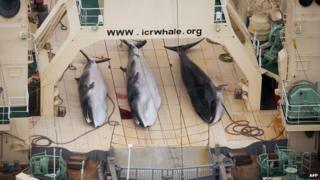 Japan cut down its catch by two-thirds under its new research plan, and has stuck to taking about 330 whales each year. After a few weeks of surveys, the team caught all the whales within just 12 weeks before setting off back to Japan. The whale meat is then sold to be eaten. Why does Japan hunt whales? Under Article VIII of the International Convention for the Regulation of Whaling, signed in 1946, countries can "kill, take and treat whales for purposes of scientific research", and this is the rule Japan says it follows in its hunts. Coastal communities in Chiba prefecture and Ishinomaki in northern Japan have long practised coastal whaling, while Taiji in Wakayama prefecture holds annual dolphin hunts. However, expeditions to the Antarctic for whale meat only began after World War Two, when the devastated country depended on whales as its main source of meat. While the meat is still sold, it is increasingly unpopular, with far fewer businesses selling it now than in the past. Does anyone else hunt whales? Figures from charity Whale and Dolphin Conservation (WDC) show that many countries other than Japan still catch whales. The International Whaling Commission (IWC), which regulates the industry, agreed to a moratorium on commercial whaling from the 1985, with exceptions. Norway and Iceland still hunt whales for meat, the former rejecting the moratorium and the latter only partially agreeing. So-called aboriginal subsistence whaling for local communities continues in Greenland, Russia, the USA, and St Vincent and the Grenadines. But Japan remains the only country to send ships to Antarctica to catch whales, under the scientific research exemption. Is the hunting wiping out Antarctic whales? Japan says it is conducting its research to show the Antarctic whale population is healthy and can be sustainably fished. The International Union for Conservation of Nature (IUCN) says there is insufficient data to determine whether the Antarctic minke whale is threatened. While the number of minkes is "clearly in the hundreds of thousands", they are investigating a possible decline over the last 50 years. Depending on how significant the drop is, the Antarctic minke could be classified as Least Concern, or as Endangered.